Disney Parks Minnie Mickey Mouse Bride Groom Porcelain Wedding Figurine Cake Topper by Disney at Good Time Donuts. MPN: unknown. Hurry! Limited time offer. Offer valid only while supplies last. Get carried away by Disney's Wedding Mickey and Minnie Mouse Figurine. Mickey looks dapper in his tux as he sweeps the lovely Minnie off her feet. 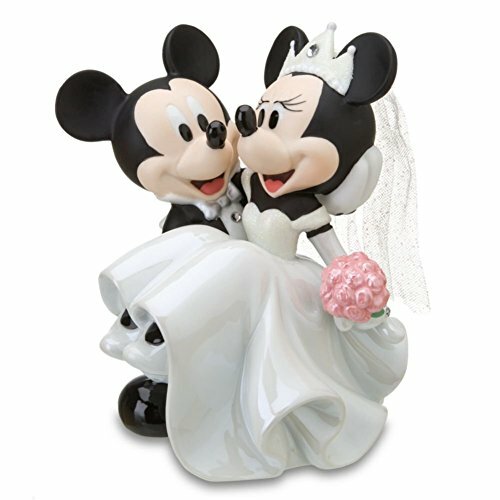 Get carried away by Disney's Wedding Mickey and Minnie Mouse Figurine. Mickey looks dapper in his tux as he sweeps the lovely Minnie off her feet. She wears a beautiful wedding gown accented with glitter, tulle and a sparkling rhinestone veil. Can be used as a beautiful cake topper or collectible decorative figurine. Approximately 6.5" tall and 5" wide, weighing about 1.3 pounds.